Lamborghini Gallardo Crashes UNDER Saab! Home »Unlabelled » Lamborghini Gallardo Crashes UNDER Saab! 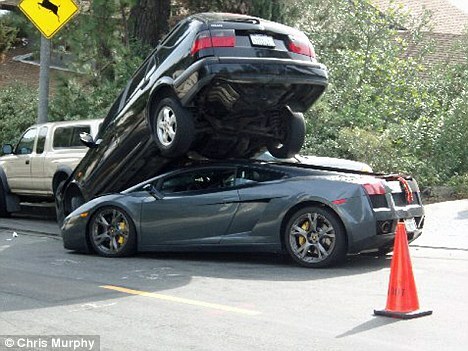 In Hollywood Hills, California, a Lamborghini Gallardo driver slid his car right under a Saab wagon. As you can see by the pictures below, the Saab ended up on the roof of the Lamborghini.